Three years ago I got the crazy idea to take my then 10-year-old son on a weeks-long cross-country road trip. We had no idea what to expect or whether it would end in joy or disaster. In the end we both had so much fun that we decided to do it again. And again. And again. Of course, there were a few problems with this idea. For starters, driving through the southwest on Route 66 didn’t go very well for the Joad family. But that was almost 100 years ago, and also the Joads are not real. Problem solved. 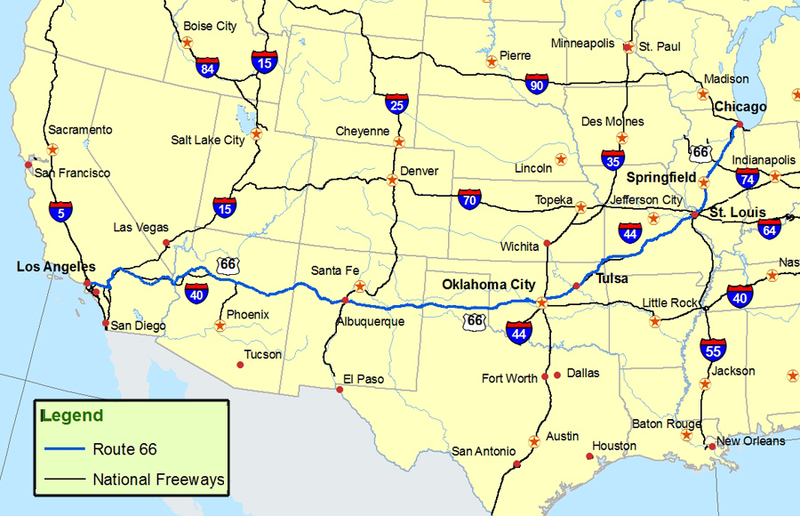 Another challenge was that Route 66 is a ridiculously long road–as the song says, “it winds from Chicago to L.A.” We could just drive part of it, as millions of travelers before us had. But I don’t like to do things halfway, so we decided that if we were doing it at all we were doing it completely. And finally, how on earth do we get back from Los Angeles? It would be boring to go back the way we came, but we’ve seen so much of the country that other routes would be equally boring. I looked into taking one of those auto trains where you drive your car onto a train, ride the train, and then drive off when you reach the destination. But it turns out there’s only one such train in existence currently, and it goes from Virginia to Florida, which is entirely unhelpful. Another option was flying back from California and having our car shipped back, but that’s pretty expensive, and, well, then we don’t get to do and see more stuff on the way home. Ultimately I solved the problem by plotting a more southern route home that is not quite as direct but brings us mostly through places we haven’t seen. So it was settled: this year’s trip would be not merely The Hamster and the Highway, but The Hamster and America’s Highway. We may be the gazillionth people to drive what Steinbeck called the Mother Road, but it will be an intensely personal experience just the same. All told, the plan is to hit 17 states in 31 days, including some national parks, some major cities, some tiny towns, some deserts, some really odd roadside statues, and of course some ballgames. And thus was born Road Trip IV: The Road Trip to End All Road Trips. This is not just a cute nickname for the trip–our fourth father-son cross-country road trip will likely be our last, because once we’re done we’ll have very little of the country left to explore, plus the Hamster will be almost 14 next summer and will be more likely to spend the summer in camp somewhere, either as a camper or a CIT. Sam has suggested that we drive through Europe next summer, but the logistics would be monstrously difficult to work out, we don’t speak the languages, and we would never get the giant Costco barrel of pretzels through Customs. I hope we’ll never stop looking for adventure or having fun together or exploring the world, but as far as major road trips go this is likely our last hurrah. Tomorrow morning we’ll jump into our fully packed Toyota Solara convertible and head out on a crazy road adventure for (probably) the last time. In 24 hours we’ll be several states and a time zone from home. More important, we’ll be at the beginning of Route 66, ready to follow Nat’s advice and get our kicks. Enjoy the trip, and have fun extending your jet lag with every time zone you pass through.